For many of us, nothing sounds better than long, uninterrupted hours of catching Zzz’s. We think of rest as healthy and restorative, a precious commodity that always runs short when we need it most. We may experience bouts of sleeplessness or even chronic insomnia, which is trouble falling or staying asleep, waking too early, or a sensation of unrefreshing sleep. Our problem is too little sleep, not too much. Too much sleep…is there even a word for that? Yes, in fact, there is. Hypersomnia. Most adults feel rested and perform best when they sleep between seven and nine hours each night. For hypersomnia sufferers, however, no amount of sleep may be enough. Some people diagnosed with the disorder may spend a full half of their lives in bed and never feel fully rested or alert. It’s not unheard of for a hypersomnia sufferer to sleep in excess of sixteen hours at a time and still need to take naps. Imagine heading to bed at 10 o’clock at night and getting up in the middle of the following afternoon… every single day. Hypersomnia can be a primary sleep disorder — meaning it happens by itself — or occur as a result of other disorders, illnesses, or lifestyle choices. Though the term might be unfamiliar to most of us, the disorder is more common than you might think. Famous people afflicted with hypersomnia include Winston Churchill, Jimmy Kimmel, and Harriet Tubman, who used to fall asleep frequently and without warning while helping slaves escape through the Underground Railroad. Note: The content on Sleepopolis is meant to be informative in nature, but it shouldn’t taken as medical advice, and it shouldn’t take the place of medical advice and supervision from a trained professional. If you feel you may be suffering from any sleep disorder or medical condition, please see your healthcare provider immediately. Mental, emotional, and social consequences, known as secondary symptoms. These include depression, anxiety, slow speech, and mental effects like memory loss and concentration issues. (2) Hypersomnia depression may be a cause or symptom of the disorder, or both. Though secondary symptoms vary from person to person, almost everyone afflicted by hypersomnia shares certain symptoms, such as sleep inertia. This refers to a feeling of confusion or even total disorientation when waking up, and a longer time transitioning from sleep to feeling alert. Sleep inertia may result in chronic lateness, or less time spent with friends and family. Feeling tired and run down this week? This month, even? Doctors won’t diagnose hypersomnia until a patient experiences unusual daytime sleepiness for three consecutive months. When doctors do suspect hypersomnia, they generally use two well-known tests to assess the severity of a patient’s symptoms. One hypersomnia test is subjective, meaning it relies on an individual’s memories, feelings, and opinions. This test, called the Epworth Sleepiness Scale, asks people to rate how likely they are to fall asleep during certain ordinary activities. For example: how likely are you to fall asleep while sitting and talking to someone? While sitting in traffic? The higher your score, the greater the chance you’re suffering from a sleep disorder. The objective test — meaning the data can be measured scientifically — is the Multiple Sleep Latency Test. This test measures a patient’s brain waves, muscle activity, and eye movements during a period of naps. Using these readings, a sleep specialist can discern between a patient who is simply tired, and one who has a sleep disorder. Once excessive daytime sleepiness is diagnosed, doctors usually conduct a complete medical examination to screen for possible causes, along with tests to check for other sleep disorders. There are two types of hypersomnia: primary and secondary. 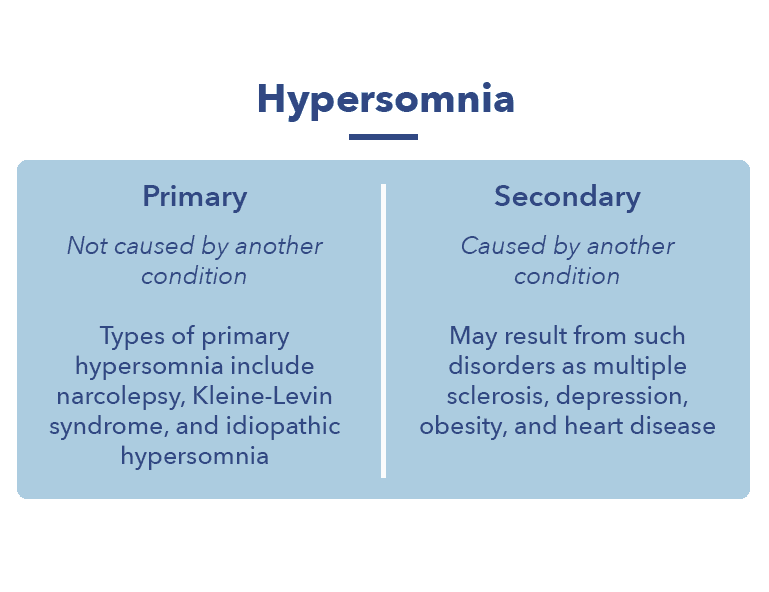 Primary hypersomnia means that the hypersomnia and its symptoms are the main issue, while secondary hypersomnia occurs as along with another medical problem. Narcolepsy – A sleep disorder defined by excessive daytime sleepiness and what are called “sleep attacks.” These attacks cause the individual to immediately and uncontrollably fall asleep. Narcolepsy likely results from an autoimmune response that happens after a viral infection. The disorder tends to appear during childhood, when a child’s developing body is more vulnerable to influenza and other viral illnesses. The immune system attacks the molecule that controls sleep and waking after confusing it with a portion of the flu virus. Idiopathic hypersomnia – Hypersomnia with no known cause. Despite getting more sleep than is medically necessary, sufferers may never feel fully rested or awake. Living with idiopathic hypersomnia may be frustrating to sufferers, not only because of the disorder’s symptoms, but because the symptoms lack an apparent explanation. 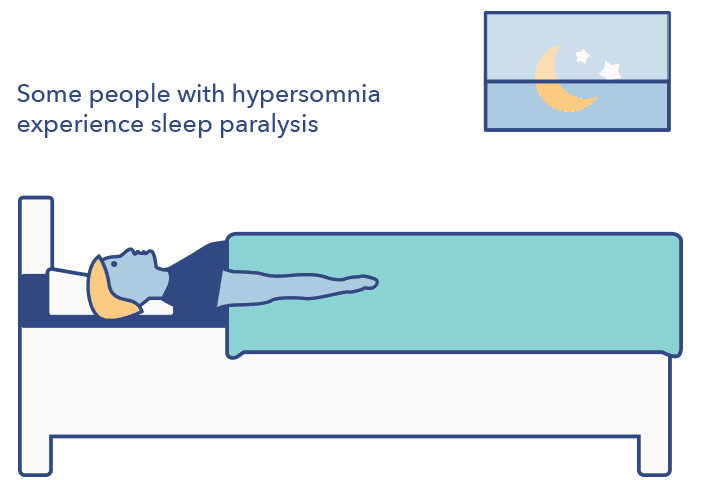 Hypersomnia Fact: Some people with hypersomnia experience sleep paralysis, which occurs when the muscle weakness that accompanies REM sleep persists after waking. Other causes of secondary hypersomnia include mood disorders. There is a strong link between hypersomnia and mental health issues, particularly depression. Other causes of the disorder include low thyroid function and brain injuries. Harriet Tubman’s narcolepsy was likely caused by an injury she suffered as a child, when she was hit in the head by a two-pound weight. It may seem to go without saying that chronic fatigue syndrome is a common cause of hypersomnia. After all, what is chronic fatigue if not feeling tired and sleeping a lot? But chronic fatigue often comes with an array of other symptoms not usually experienced by hypersomnia sufferers, such as dizziness, joint pain, and enlarged lymph nodes. Sleep apnea is the most common sleep-related cause of secondary hypersomnia. The breathing of sleep apnea sufferers might be extremely shallow, or even stop altogether. Studies of sleep apnea sufferers show that breathing can stop as many as thirty, fifty, even ninety times an hour. Feeling chronically exhausted after a full night’s rest may be linked to sleep apnea, which can severely affect the quality of an individual’s sleep. People with sleep apnea may be at risk for dozing off while driving, operating machinery, or at work. In addition, sleep apnea increases the risk of stroke, and may contribute to obesity and heart disease. Another sleep disorder associated with secondary hypersomnia is restless leg syndrome. This disorder causes a strong and irresistible urge to move one’s legs, particularly while resting. Some sufferers describe an extremely uncomfortable or almost painful sensation which is only alleviated through movement. As with sleep apnea, this disorder can cause daytime sleepiness that interferes with work, school, and family obligations. Hypersomnia Vs. Narcolepsy: Narcolepsy is one form of hypersomnia, a term which encompasses a broad range of sleep disorders involving excessive daytime sleepiness. The word narcolepsy is often mistakenly used for any disorder that causes extreme sleepiness, though it is a distinct disorder with its own symptoms and etiology. He collapsed because of cataplexy, a frequent symptom of the form of hypersomnia known as narcolepsy. 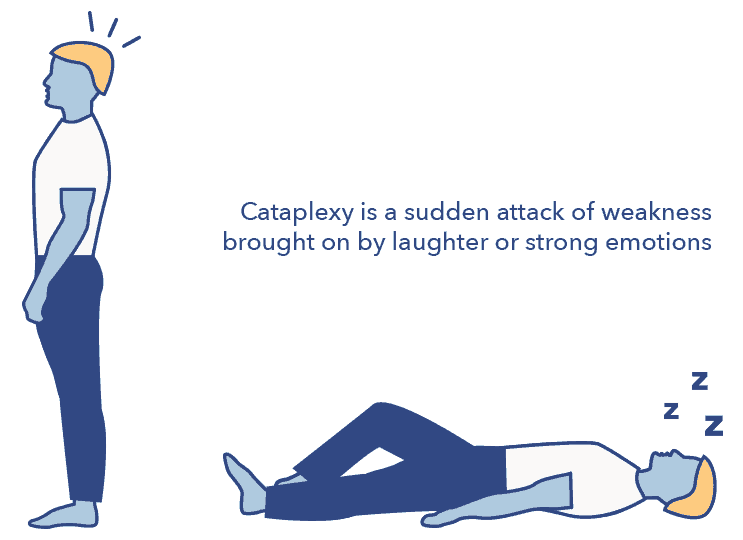 Cataplexy (from the Greek, meaning “strike down”), is a sudden attack of weakness brought on by laughter or strong emotions, and it occurs because the brain can’t regulate the states of being asleep and awake. When the states overlap, a person with narcolepsy falls into REM sleep, the period during sleep when muscles are weakest. This can happen so suddenly that sufferers fall to the ground. Hypersomnia Fact: Narcolepsy that occurs with cataplexy is called Type 1 Narcolepsy. Narcolepsy that occurs without it is called Type 2. 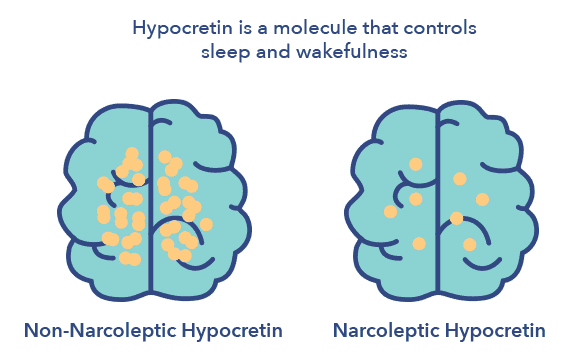 Hypocretin controls sleep and wakefulness, and patients with narcolepsy appear to have too little of it. The molecule also regulates the feeding center of the brain, which might help to explain why sufferers of the Kleine-Levin form of hypersomnia experience periods of extreme hunger. The bodies of narcoleptics tend to produce more histamine, which signals the brain to wake up. This may be the body’s inadequate response to the loss of hypocretin after an immune injury. The age of children at diagnosis is getting younger. This could be because some recent flu strains are very effective at inducing hypersomnia reactions. In Finland in 2009, the Pandemrix vaccine may have triggered narcolepsy in 1 out of every 16,000 children vaccinated. (8) This particular vaccine was formulated specifically for the H1N1 virus, and not been used since. The answer is — maybe. It depends on the type of hypersomnia and the unique physiology of each individual. Secondary hypersomnias caused by a condition such as multiple sclerosis, chronic pain, or depression may be preventable with proper diagnosis and treatment of the underlying issue. If hypersomnia is caused by drug side effects, this may be remedied by a change in dosage, becoming adjusted to the medication’s effects over time, or switching to a medication that causes less drowsiness. Primary hypersomnias such as idiopathic hypersomnia and narcolepsy may not be preventable. Idiopathic hypersomnia is a sleep disorder that occurs without an apparent cause, while recent research shows that narcolepsy is likely an autoimmune disease triggered by a viral infection. Most narcolepsy cases are diagnosed in childhood or adolescence, when viral infections are particularly common. Though it may potentially be possible to prevent narcolepsy by avoiding viral infections, it is probably not feasible to ward off all colds and flus, the likely culprits behind nearly all instances of narcolepsy (reactions to certain flu vaccines have been cited in a few unusual cases). However, the vast majority of children, adolescents, and adults recover from viral illnesses without an autoimmune reaction such as narcolepsy. And remember — primary hypersomnias like narcolepsy are considered rare, with an incidence of approximately 1 in every 2,000 people. Chances are, a little daytime sleepiness or lingering fatigue after an illness will diminish in time or with a healthy change in sleep habits. Hypersomnia may be treated with stimulants — such as modafinil or Ritalin — that are commonly used for attention deficit disorder as they’ve been shown to help sufferers feel more awake, well-rested, and focused. Some antidepressants (like fluoxetine, sertraline, or citalopram) have also been used to treat the disorder. However, it’s important to note that taking these drugs over time may make them less effective and increase the risk of side effects. Eliminating environmental disturbances such as noise, excessive light, and interruptions by children and pets can help prevent fatigue resulting from fragmented sleep. A comfortable mattress and controlled air temperature are also important for limiting sleep disturbances. Other natural hypersomnia therapies include yoga, hypnosis, and meditation, which may help some hypersomnia sufferers relax, control anxiety, and become more aware of subtle symptoms that signal when a sleep attack is likely to happen. Most existing treatments for hypersomnia — from drugs to improved sleep habits — involve the management of symptoms. Treatments on the horizon include immunotherapy, endocrine therapy, and the development of new and more effective medications. There is ongoing research into the manipulation of skin temperature, as well as treatment of the autoimmune response involved in narcolepsy. (9) Also under development are medications that act on histamine, which plays an essential part in wakefulness. Future treatments may harness gene therapy to restore levels of hypocretin in the brain. Other brain cells could be harnessed to produce hypocretin, which is too large to cross the blood brain barrier. Beyond medical treatments, raising awareness and increasing understanding of narcolepsy may help to mitigate some of the social difficulties faced by sufferers.